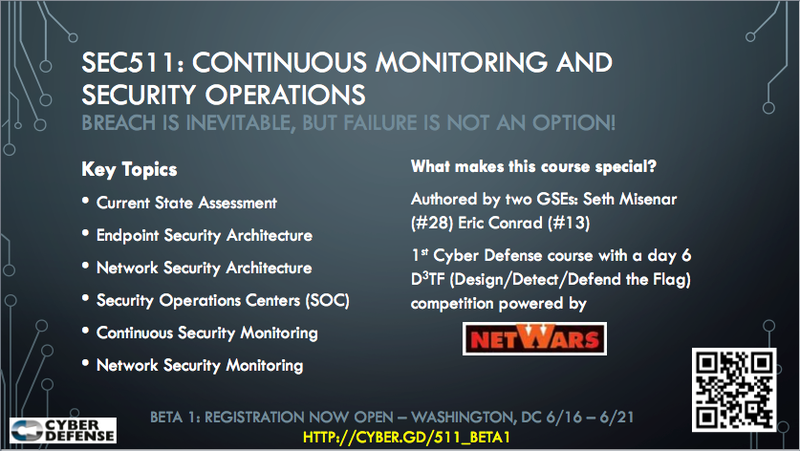 I am happy to announce that the first beta for SANS SEC511: Continuous Monitoring and Security Operations has been scheduled for June 16-21 in Washington DC. Seth Misenar and I wrote the class, and it's proven to be a very timely (and necessary) topic! I will teaching the first beta. Note: This course is eligible for special beta pricing. Please enter discount code SEC511-BETA1 when registering to take advantage of the special beta price of $2450.